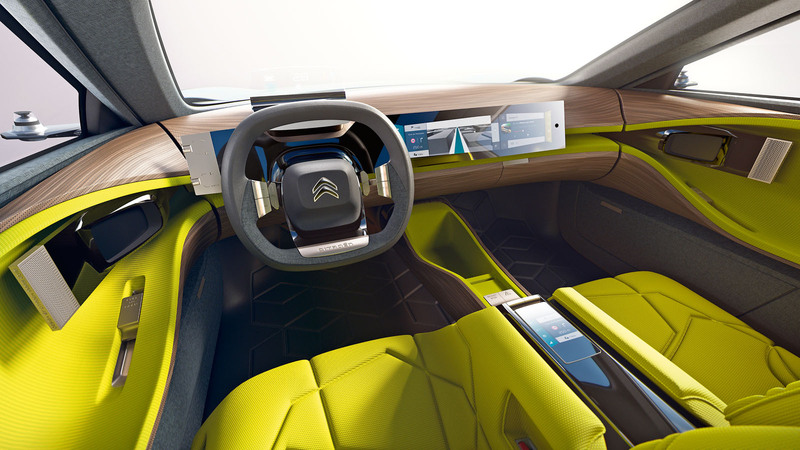 Citroen has revealed a new executive saloon concept, called Cxperience, which uses a plug-in hybrid petrol-electric powertrain and features the brand’s Advanced Comfort programme and a host of interior technology. The company says the concept showcases future Citroëns and demonstrates how the styling of recent smaller cars, such as the C4 Cactus and new C3, can be used on larger models. The Cxperience is 4.85m long (a similar length to the C6 saloon), just 1.37m high and has a 3m wheelbase. It has short overhangs and 22in wheels with a five-spoke design. Exterior highlights include adjustable air intakes on the front bumper, an aerodynamic concave rear window and rear-hinged doors giving easy access for passengers. Inside, a 19in rectangular display controls vehicle functions and has a split-screen function to allow, for example, a passenger to watch a film on two-thirds of the screen while the driver uses the remaining third for navigation. Door-mounted cameras replace the exterior mirrors and send pictures to small digital screens on the inner door panels. Along with front and rear cameras, the driver gets a 360deg view around the car. The concept also features the ConnectedCAM camera, which was first seen on the new C3 and records the road ahead. Citroën’s Advanced Comfort programme was revealed exclusively to Autocar earlier this year. It includes an overhaul of the brand’s suspension system and also focuses on filtering out external noise and vibration and addressing seat comfort. The Cxperience’s petrol engine and electric motor produce up to 300bhp. Driven in all-electric mode in the city, it has a claimed range of 37 miles. The concept uses an eight-speed automatic gearbox mounted transversely between the petrol engine and electric motor, and a compact battery positioned under the cabin to deliver electric power to the rear axle. This layout means both passenger space and boot capacity are maintained, according to Citroën. If the next C4 and C5 take on a look which is not to far away from this concept, and offer the ride comfort suggested, I think they could be on to a real winner. I think the move to electrified vehicles could be a big plus for PSA and the Citroen brand in particular assuming they can get the tech needed right. Only question surrounds where they take DS Automobiles now to differentiate from a new generation of big Citroen? Re: C5, I don't see this being replaced, not in the UK anyway. DS5 premium model a defacto replacement. Why do manufacturers always tease us with interesting and good looking big saloon/hatch/coupe models, but the production models are always boring small saloons or crossovers. Nothing there that can't happen - except perhaps I expect any production car to have exterior mirrors. This could be the future look of the Citroen range. And I think it - right for Citroen to focus on comfort and refinement. That way it can secure it's own niche in the market place. By offering something - bit different. Will the new suspension system give the height adjustability of the existing hydropneumatic suspension as well as it's adjustable spring rate and great ride/handling balance? I hope so. Everyone elses air suspensions do.